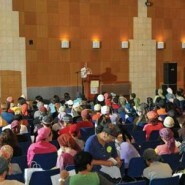 5000 JewishMOMs getting psyched about motherhood at the annual Binyan Shalem conference. I love it! But while I enjoy the interesting classes on motherhood and marriage, for me the most inspiring thing about Binyan Shalem is just seeing so many JewishMOMs in one place. Chances are that between them these 5000 JewishMOMs have over 20,000 children, which means they are raising a large chunk of Israel’s next generation—and filling them up with faith and love of Torah and Hashem. So every year when I see these holy and queenly moms, who never gather all together except at Binyan Shalem since they are all so busy raising their kids, I just feel awe to be among them and one of them. Today was the second day of this year’s three-day conference, and the first event on the schedule was the conference’s “Central Ceremony.” So I joined around 3000 of the Binyan Shalem JewishMOMs in the largest hall of the Jerusalem Conference Center in order to hear speeches from a government minister or two and to receive blessings from some of Israel’s leading rabbis. When Rabbi Shmuel Eliyahu stood up to walk towards the podium, the entire crowd stood up en masse to honor him. And tears came to my eyes—-seeing thousands of such impressive Jewish mothers standing to honor the Torah. But Harav Eliyahu looked out at thousands of JewishMOMs, and you know what he said? Thanks for Sharing! Is this conference in Hebrew only, or are there English speakers as well? I would love to come to it next year! Please let us all know when the next Binyan Shalem is. unfortunately, it’s all in Hebrew! it’s really a shame. Though I think English speaking moms should come just to see that many JewishMOMs in one place! I also always get teary whenever I see all the holy women coming to one place to learn and grow in their roles as Jewish women. It is so inspiring to be a part of! Hope you enjoyed it as much as I did! By the way, EVERY YEAR on the evaluation form I always suggest they make an English track – even one day out of the three! There are so many people who would love to come but don’t understand Hebrew well enough to sit in on a shiur. Maybe some day it will happen! I also mentioned this idea last year to Rabanit Levanon, and I gave her my number and told her I would be happy to help publicize the English conference on JewishMOM.com. Midreshet HaRova, which is associated (I’m not sure exactly how) with Binyan Shalem, does have programs in English for women of all ages, although to the best of my knowledge not a three-day – which had been a two-day – conference such as Binyan Shalem has. Also Binyan Shalem is not just for moms, or even married women. There are lectures and lecture tracks which are designed for single women. right, binyan shalem has tracks also for single women and also grandmothers. Though the vast majority of participants are young mothers.